Shih Tzu dogs are one of the brachycephalic breeds meaning that they have short noses and flat faces. This can, and often does, lead to breathing issues. If you have one of these popular pups check the information in this guide about Shih Tzu breathing problems. My Shih tzu is about 11 years old and for the past year and a half she has been having these little breathing attacks that scare me it is like she can't get enough air! Does anyone know what this could be? and if there is anything that I can do to either help her or stop it from happening? Is your dog overweight? If so, that causes breathing problems and she need to go on a diet and the breathing problems will go away. If this is not the case then you need to take her to the Vet. It could be something serious. Better to have it checked out. My 10 yr old Shih Tzu Darby has the same occasional wheezing, gasping, abnormal breathing noises. Vet said most smushed nosed dogs do this. I just baby him till it's over, about 30 seconds to a minute. This sounds a little like "reverse sneezing." It is fairly common. However, I would have a Vet check her out to rule out other possibilities, especially given her age. We have a Shitzu and we're pretty sure that what most of these comments are referring to is a snoring-type noise, and we're 99% sure it's caused by Heartburn. i.e. an acid bubble coming up from the dog's stomach, and popping in their nose. Squeeze the nose lightly, and get the dog to drink some water if possible, to clear the acid. Then, give a little chunk of an antacid tablet. That works. But, what we're concerned about, is different. Like having a stuffed-up nose,+difficult night-breathing, and we'd like to know if anyone has experience with a Shitzu that has had laser or other correction for that. I have learned that when either one of my dogs has this problem, I just pick them up and blow in their nose and they stop right away. I think I read that on this site and it seems to do the trick. My 10 year old Shih Tzu is having troubles breathing. He is gargling and struggling, sneezing, and having nose bleeds. What can we do? He's already on antibiotics. We've been giving him saltwater baths, rinsing his nose out. I would consult the vet. Your dog may have Brachycephalic Airway Syndrome or other condition that needs surgery. He needs to go back to the Vet. Or perhaps he needs to see a new Vet. This sounds serious. Antibiotics is probably not going to be adequate. My Shih Tzu has been almost snoring when she breathes. It sounds like she is congested, but there are no visual problems. I think maybe she has mucus stuck in her throat? We are on vacation in El Paso where we came back from Ft. Campbell in KY/TN if that has anything to do with the problem. 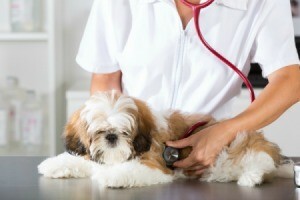 Your dog may have allergies or a cold. If I were you, I would be concerned about a change in breathing and see a vet in the area. Breathing issues always warrant a call to the vet. If your dog was traveling with you when this started, detail all of when/where/how things started. If you think it is getting worse or the pup is lethargic or not eating, drinking, or there are changes to potty habits, consider taking the pup in to a vet or vet hospital immediately. Prayers for all. Post back what you learn! 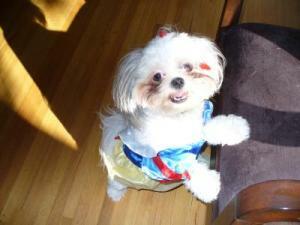 Per this website Shih Tzu are prone to breathing issues. It is hard to self diagnosis, recommended to see a vet. I know a lot of you ThriftyFunFans have Shih Tzus. We have two. One of ours makes this funny noise like he can't breath from time to time. We just try to get him to calm down and it eventually goes away. Does anybody know why they do that? I've heard several theories from allergies, heart problems, etc. 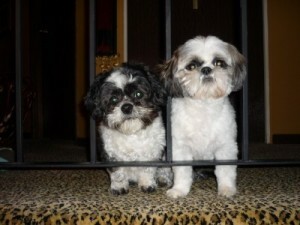 I have two Shih tzu also and both of mine have issues. My female snores really bad and then sometimes sounds like she is snorting; that does not concern me so much; however my male goes into an all out fit with his choking, coughing, and doing this thing that sounds like he can't get any air into his lungs. I usually pick him up and calm him down and this helps some. Sometimes I take a medicine dropper and get water into his throat, that seems to help some; and then sometimes I feed him some Vaseline off the tip of my finger and that will sort of lubricate his throat. One thing for sure is when this happens to either one of them they want to be very close to me. I often wonder what happens when I am at work and they have one of these fits. I can only pray that does not happen. My vet said it's because they have such a short nasal passage, pug nose. Mine tends to choke sometimes so I pat his chest and it seems to help. Also, they seem to have more allergies than most breeds, too. Mine gets a foot fungus in the summer. We too have two Shitzu's a male and a female brother and sister. They have this extreme problem you have just described. It's horrible listening to either of them when they really get going. The breathing really sounds as if the trachea is collapsing and she can't catch her breath unless we calm her down. The male does not do it quite as often, but he's just as bad when he gets going. It only seems to happen when they are either just falling asleep or are already asleep and suddenly awake and they can't catch their breath. The last time she had an attack was just 1/2 hr ago and I usually kind of massage her throat and talk to her and try and calm her down which usually works eventually. This time by accident I grabbed her lower jaw and slightly opened it trying to open her airway and this had a very positive quick response, so next time I will try this again. I think from reading how many shitzu's have this problem it seems that the trachea collapses and if you open the airway it helps. My mom just bought a Shitzu yesterday and took to the veterinarian today and he said that many of these dogs have nostrils that are too small. He said that as the dog gets bigger its nostrils will, but many have to have a laser surgery to correct the problem. However this will not happen until it is around six months old. The laser surgery is not suppose to be a big deal and isn't very expensive. Our vet told us the most un-evasive method to help our dog with the reverse sneezing is to blow into their nose when they do it and after until they are back to normal. This forces them to actually focus on their breathing. I suggest that everyone that has a dog research that breed and see the things associated with the breed. I did about a half year research on my Shih-Tzu and investigated the breeders to find one that had purebreds and mine has a 200 dog history of only Shih-Tzu. I asked many questions to find out what I was getting into beforehand knowing that was the fair thing to do for my dog. I found that when you buy them they should be checked for something that is similar to the bulldog. Soft pallet issues. If there is a soft pallet problem it may need surgery to prevent that flap of skin from blocking the wind pipe. I would suggest that anyone with a Shih-Tzu have a reputable vet check the puppy when it is young to rule that out and not rely on postings about people's other dogs, that is not your dog.